They are attractive and feel good to hold. We have tested our cones in a freezer with a dish of water and have amazing results. 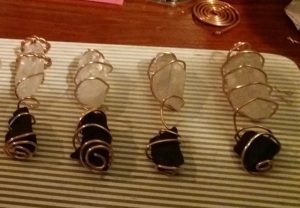 The terminated quartz crystal at the tip is connected to a shungite stone at the base with a copper wire coil. The shungite has a property that absorbs electromagnetic fields. The coil is wound clockwise going up and wraps round the crystal. The coil acts as an aerial and passes the signals to the crystal. 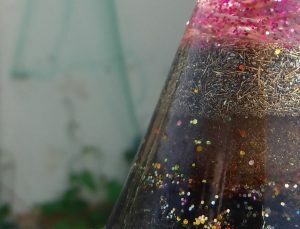 The quartz crystal is already being compressed by the resin which makes it reactive. This is called the Piezo Electric state where electricity is produced when a quartz crystal is squeezed. The crystal becomes a transducer converting energy and transducers work two ways. Physical pressure translates to an electrical charge and visa versa. As physical expansion is contained, this has the same effect as squeezing the crystal. The result is a calming of the area around the cone. 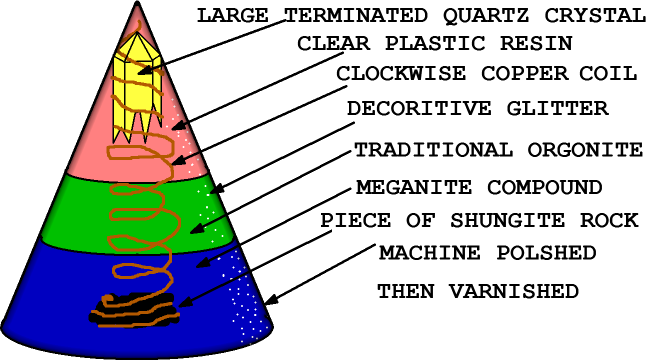 The cone also has layers of orgonite, a substance designed to accumulate Ether. This is based on Willhelm Reichs work where he discovered by sandwiching organic, crystalline, organic, crystalline materials. The Ether would be attracted to the organic and reflected by the crystalline thus accumulating. All metals are crystalline and the finer the particles it seems the better. Brass Shavings from a key cutting machine work very well. We use the finest grade steel wool and put it in a blender to chop it into fine dust. At the base of the cone is a thick layer of Black Iron Oxide with fine powdered steel wool. This is also where the shungite stone is. We have found the cone to be the best shape for the job because it has a large surface area with which to collect the Ether. The Ether Leaves the device from the sharpest edges so the base edge has been smoothed so most energy is emitted from the tip.